Happy birthday Dear Purakkal Kpm - birthdaywishes2- Birthday wishes sms,birthday wishes images,,special birthday. 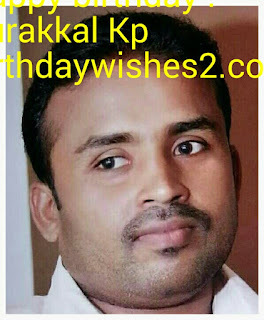 Purakkal Kpm is celebrating his 40th birthday today. He is working in a Royal Saudi Land Force in Saudi Arabia. His high school was at MVHSS Ariyallur.After joined NSS collàge Ottapalam .He is living in Sharma, Tabuk Saudi Arabia. His home town Parappanagadi.